Awaken your senses, bathe in warmth & hospitality, and revel in the romantic charm of Ebbio, an 800 year-old classic Tuscany farmhouse. 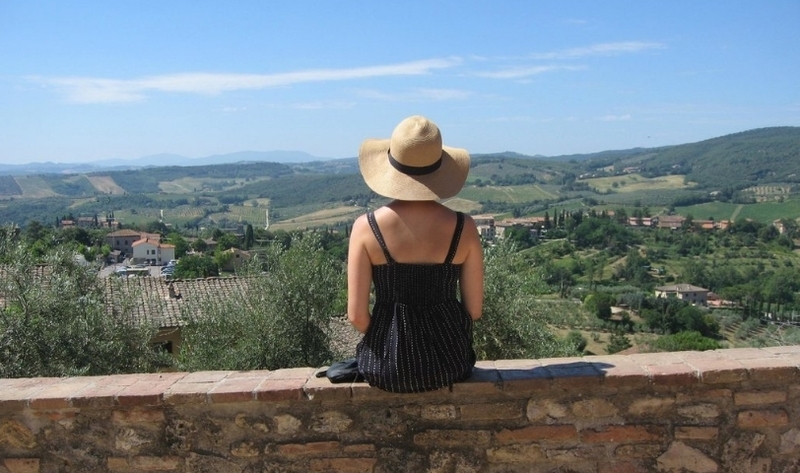 This retreat, co-led by Kate Mitcheom and Kathy Daniels will allow you to deepen your practice of mindfulness meditation & movement and explore the majestic beauty of the Tuscan countryside. The combination of mindfulness, movement, art and breathtaking countryside, dotted with castles, villas and abbeys, will leave you inspired and enriched! You’ll have the vacation in Tuscany you’ve always dreamed of and feel like the best version of yourself when you leave. View downloadable Ebbio brochure. Where We Stay: Ebbio is an 800 year-old classic Tuscany farmhouse that has been converted into a charming & stylish yoga retreat. The ambience of Ebbio offers a one-of-a-kind experience, surrounded by an evergreen forest, nestled in the heart of an old volcano that was sacred to the Etruscans. 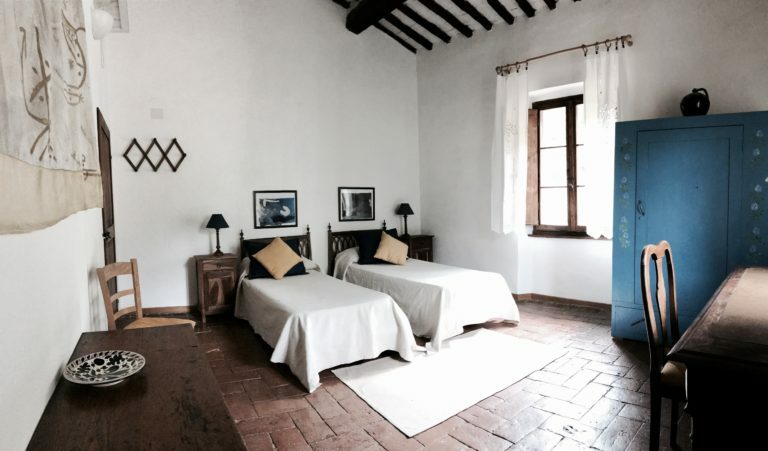 Located in the breathtaking countryside of Tuscany, Italy, it is only 25 miles from Florence, eight miles from Siena, and a half-hour walk from Monteriggioni,a little medieval jewel. You will be captivated by the undulating hills swept with thriving vineyards, olive trees and enchanting evergreen forests. The amazing part of Ebbio is that it is still a working Tuscan Farm. Read an interview with Sibilla, the happy owner of the Ebbio estate. Accommodations: The accommodations are in double, triple or quadruple rooms. All rooms are shared, cute and cozy & have a special name. There is about 1 bathroom for every 2 rooms. All bathrooms are different, some with showers, some with bathtubs. There is also a bathroom with showers off the yoga room with privacy for two people. We will assign the rooms on a first-come, first-serve basis. View the accommodations here. Please remember this is a very rustic 800 year old stone Tuscan Farmhouse with open windows & fresh air and you will hear animal noises. What you can expect daily: movement and meditation in the morning, art & exploration in the afternoon and revelry and rest in the evening! Activities: In addition to your group focus, there is an extensive and well maintained hiking trail system, horseback riding in the wooded forests, or simply walk and breathe with the company of a friendly donkey. Mindfulness and Movement Workshop: Two morning sessions, led by Kate Mitcheom MSN, CNM, RYT, Certified Mindfulness-Based Stress Reduction Instructor. Kate is a master teacher who integrates 20+ years of meditation and movement into her open-hearted style of teaching. Excursions led by Kate and Kathy Daniels MA. Kathy is an art historian and former gallery director for St. Catherine University. Kathy and Kate are life-long friends and both are graduates of St Catherine’s University, class of 1973. Here’s a little more About Kate and About Kathy. Roman Hot Springs – Petriolo – hot spring water with a crystal clear river or Terme Di Rapolono, L’ antica Querciolaia that has different kinds of spring-fed pools. Nearby Beaches – The National Park of Alberese – fantastic for long walks along the shore and swimming in the Mediterranean.